*Update 28 June 2016: We have recruited all of the animals that we have funds to genotype. We are still happy to receive hair shedding scores, especially for animals with GE-EPDs. But, we will not be collecting any more DNA samples to genotype additional animals. It’s time to pick a new AI sire. You identify a promising sire, but then you are left with a question. Will his daughters work in your environment and the environment of your customers? A new research project lead by researchers at the University of Missouri, Texas A&M, University of Arkansas and DeltaG will use existing data to look for genetic adaptation to regional beef production environments. Much of this research will look for gene-by-environment interactions. When gene-by-environment interactions exist, some genetic variants have large effects in some environments and small effects in others. This leads to cattle that perform poorly in a certain environment, but well in other conditions. Cattle poorly adapted to their environment result in lost revenue and cause headaches for farmers and ranchers. One of the goals of this research project will be to create region-specific genomic predictions, thus helping farmers and ranchers match cattle genetics to their environment. Pictures courtesy of Mississippi State University. A portion of this project will focus on genome-wide analyses of adaptive traits, such as hair shedding. The research team invites producers of registered cattle to participate in this research. They request that producers commit to participating in the project for 3 years (2016, 2017 and 2018). Of course, cattle will enter and leave herds, but as much as possible, the project would like to have 3 years of hair shedding scores on each animal. In 2016, producers should collect a DNA sample (blood cards preferred) on animals in their herds that are 1-year old or older. Please include farm/ranch name, herd ID, and registration number on each blood card. In May or June of each year, each animal is scored for hair shedding (see Hair Shedding Scores). Each animal must be individually identified, for example with an ear tag, tattoo, or freeze brand. Farmers and ranchers need to collect samples and report data for every animal in their herd older than 1 years of age (whole-herd reporting), and the herd must have a minimum of 10 animals. Cattle must not have Zebu (Brahman) influence and must be registered with a breed association utilizing genomic prediction (Angus, Charolais, Gelbvieh, Hereford, Limousin, Red Angus, Shorthorn, or Simmental). Producers are also required to submit weaning weight data to their breed association on the progeny of cattle used in this project. Producers are encouraged to visit https://missouri.box.com/HairSheddingSummary to learn more about data reporting requirements. Producers from the Gulf Coast and Fescue Belt are encouraged to participate (Missouri, Arkansas, Tennessee, Kentucky, West Virginia, Virginia, North Carolina, South Carolina, Georgia, Alabama, Mississippi, Florida, Texas, Oklahoma, Indiana, Illinois and Ohio). Also, producers from high altitudes who would be willing to report pulmonary arterial pressure (PAP) scores and hair shedding scores are also encouraged to participate (for example, breeders in New Mexico, Colorado, Utah, Wyoming, Idaho and Montana). In return for participating in this project, the research project will DNA test (genotype) your animals with a panel that contains 200,000 DNA variants (SNPs). Approximately 30,000 of these variants are shared across multiple genotyping panels and can be used to impute missing genotypes (much like i50K or GGP-LD products). Imputation is the process were a smaller number of DNA variants are used to infer the genotypes at a larger number of variants based on patterns of inheritance (see https://youtu.be/mTd7pMN9nQo or http://bit.ly/2064dQm for more information). We will provide these genotypes to the producer’s breed association. 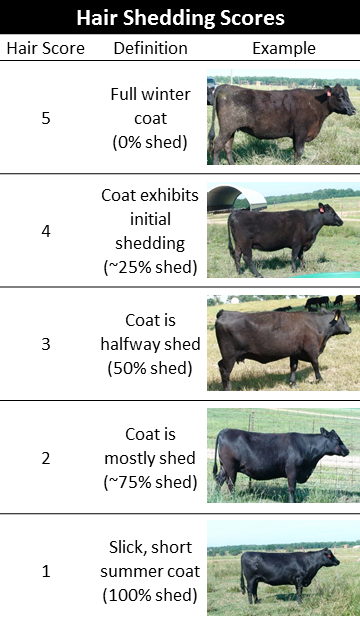 The breed association will then produce genomic-enhanced EPDs (GE-EPD) for the cattle used in the hair shedding project (see Data Sharing Schematic). Thus, for participating in the project for 3 years, producers will receive GE-EPDs for their animals at a greatly reduced cost. (Producers are responsible for purchasing needles, syringes, and shipping of blood cards. The research project will pay all genotyping costs.) 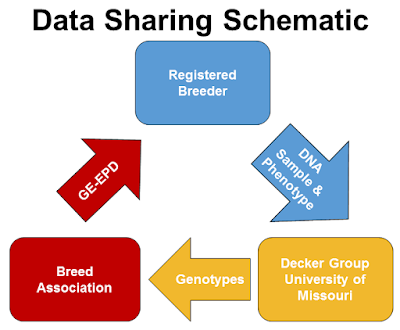 All producers are welcome to contribute phenotypic data (hair scores), but genotyping will be limited to approximately 8,000 animals, so the research team may not be able to genotype all submitted animals. Producers are also strongly encouraged to submit hair shedding data on animals that already have GE-EPDs. For more information about the project please contact Jared Decker at deckerje@missouri.edu or call 573-882-2504, your local University of Missouri Livestock Specialist or your breed association staff. Watch for a frequently asked questions section in a future post.